I wanted to share some of the products that I really enjoyed using last year. Some products were new to me and some were things I found very useful. I could have listed many more products, but I decided to keep it simple and choose only ten. If you would like to learn more about the products I've mentioned, let me know. I hope you enjoy and find this informative. Distress inkpads and stains were not new to me in 2012, but I was able to complete my collection with all the colors that are available. There's really a lot to talk about with distress inks. 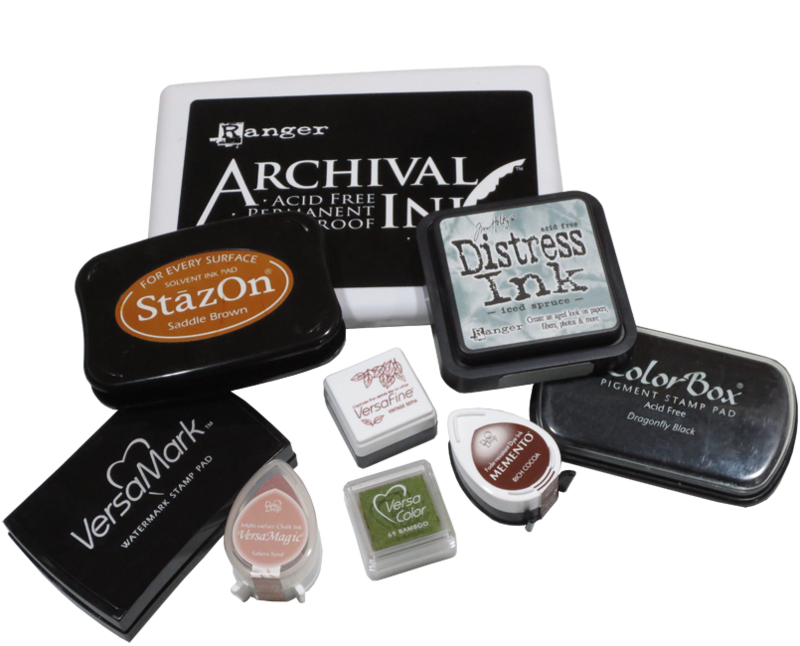 To make it short, they are great for inking edges, coloring paper/ribbon, making backgrounds, giving projects an aged or vintage feel, and creating watercolor effects. This was an ink I really wanted to try and finally did. It's now my favorite stamping ink so far. I have mostly the cat's eye sized pads which I bought on sale for only 98¢ each. The ink comes in a wide variety of colors. It gives a clean, crisp image with rubber stamps, clear stamps, and photopolymer. It even stamps well on cheap cardstock. The ink dries really fast, it's easy to clean up, and it's waterproof when heat set. I love this tool! It punches two hole sizes; 1/8 and 3/16, and sets eyelets and snaps. There are two big reasons why I love this tool. It can punch through a wide variety of materials and it has a six inch punching depth which makes it great for almost anything. I have all five of the corner chompers and I love them all. I like to mix and match the punch styles when matting layers on cards or layouts. 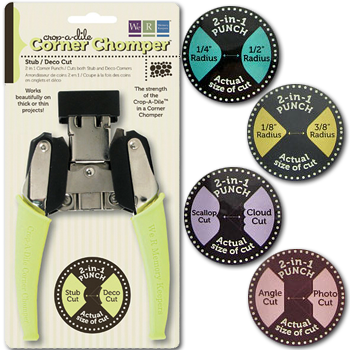 They're easy to use, decorative, and have the same punching power as the crop-a-dile. This punch is my most used punch of all time. Unfortunately, this punch has been discontinued. If you can find it, buy it. It adds a nice decorative touch for many projects, but where I've used it the most isn't crafting related. I use it when I'm filing papers or labeling different sections in binders. I simply print out a title, punch it, and glue it on. I love it! 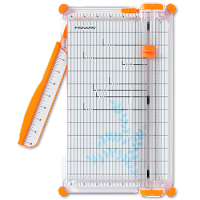 I have two guillotine style cutters; one for chipboard and this one is for my cardstock. 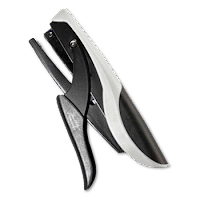 They give a clean, precise cut and are easy to use. I prefer guillotine cutters over rotatory cutters because of the ease of use and a cleaner cut edge. 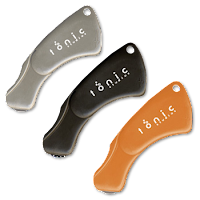 Tonic makes a smaller base trimmer with an extension arm, but I prefer the 12" base. I also like that the handle can be removed and stored on the bottom side of the trimmer. Also from Tonic are these mini rotary tools. 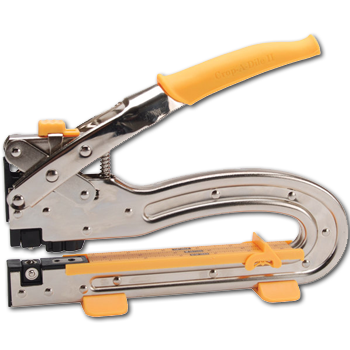 There is a perforator, cutter, and scorer. I purchased all three individually and they were really inexpensive. They are handy tools to have and are conveniently sized. The bottom portion actually folds into the handle, keeping the blades from being exposed. The shape of the tools fit nicely in my hand, giving me total control and ease of motion. This has been my most used trimmer the past few months because it's compact and easy to travel with. It has a 6 1/4" wide base with a swing out arm that extends to 15". Unlike my guillotine trimmers, I am easily able to cut partially down a page. This is great if I only want to cut out a small portion from the paper. The wire guide is the main reason why I purchased this particular trimmer. It makes it easy to line up printed image and cut some pieces. Although I enjoy using staples on projects, I didn't think this was a product I would invest in. At its original price it's more than I wanted to pay for a stapler. I happened to see it on sale and I decided why not. I am glad I made the purchase. Not only is it useful, it's decorative, and the staples are just adorable. My first cutting mat was a Martha Stewart 12" square mat. I used it and used it until it was completely destroyed. I went without one for a long time, as I was searching for the right one. After a long search, I decided on this 17" x 23" mat. 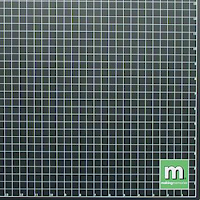 It has 1/2" grid lines which are numbered in inch increments along the edges. I like that it looks really clean, with no diagonal lines. Unlike my Martha Stewart mat I find that the self-healing properties work very well. I wanted to share an excited present I received from Neil for Christmas. It's the Big Shot! I'm super excited to now have a die cutting system. I've already had a lot of use from it and it's been a blast. 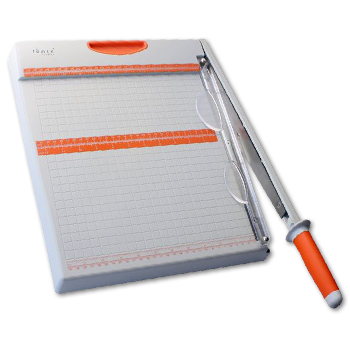 Along with the Big Shot, he bought me the Cuddlebug all-in-one 'Beautiful' embossing set and the platform to use with it. This Cuddlebug embossing system wasn't something I had ever seen before. He found it and thought it would be great since it came with several designs in one set. The embossing set came with one 5x7 embossing plate and nine smaller ones. You can position the plates anywhere on the platform and use several at a time too. There are also different sets of embossing plates that you can buy that work with the platform. 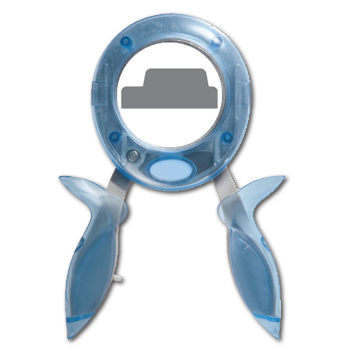 If you any questions about how the Cuddlebug plates and platform work, feel free to ask. I may do a video review when I get back into the swing of making videos. This is my first holiday card of the season. It's very well balanced and I love it. I don't make a bunch of cards for the holidays, just enough for close friends and immediate family. I will be sharing all the cards I make this year on my blog. I may also be doing a short holiday card video series as well. I'm sure many of you have finished your cards, but I almost always wait until the last minute. I hand deliver all my cards, so it's not a problem for me. I hope this card helps give you some inspiration for your holiday creations. This is a collection of Christmas color themed papers, that coordinate with DPP A. There are 4 different patterns: diagonal stripe, graph, vertical stripe, and lattice. The lattice pattern also comes in reversed colors. Included are 3 distressed solids in coordinating colors; red, green, and blue. These are 8.5x11 digital papers - 300 dpi. Patterns also come 2 per 8.5x11 sheet for conservative printing. Here is a collection of Christmas color themed papers. There are 4 different patterns: medium dots, damask, chevron, and small polka dots. The damask and small polka dots also come in reversed colors. How to Store Inkpads - Upside Down or Right Side Up? The most common question asked about storing inkpads is whether or not to store them upside down. I thought I would address this question with guidelines I follow to help you decide if you want to store them upside down or right side up. FACT - Over time gravity will take it's natural course and pull the ink down. Depending on the ink and the pad; it may take hours, days, or weeks before you notice. You may not even realize it's how you are storing your pads. If an inkpad is so saturated that it's over inking your stamps, store it right side up. This will help to pull the ink away from the surface and let the ink settle into the pad. If an inkpad seems dry, turn in upside down. Doing this will help to bring the ink back to the surface. If this doesn't work; or work fast enough, then try re-inking the pad. If you like to buy new pads instead of re-inking, try leaving the pad upside down for a few days first. Always, store inkpads flat. If you store them on their side, over time the ink will pool to one side. This will cause your pads to stamp uneven. With rainbow inkpads this is especially important, because the ink colors will mix together and get muddy. Storing them on their side can also cause the ink to seep out and make a mess. When storing inkpads upside down, some ink may seep into the lid. If the pad is not heavily inked this may not happen. Having small amounts of ink pooling into the lid isn't necessarily a bad thing. 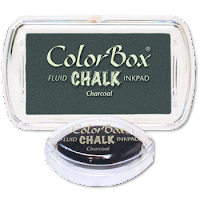 This can make an ink well for water-coloring, ink daubing, or using a blender pen. Pigment inkpads have a thicker ink and a foam pad. Because the ink is thicker it tends to stay more towards the surface. So you may not need to store them upside down. All inkpads have the potential to have seepage, but pigment inks can make more of a mess if seepage happens. If the pad is not overly juicy you may not have a problem. Just be cautious to avoid a potential mess. When storing inkpads for a long period of time; with little use, it's best to store them upside down. This will keep the ink at the surface and guarantee maximum quality of your inkpad when you're ready to use them. I hope these tips help you decide how you want to store your inkpads. If you have any questions I would be happy to help. Take Care! Today I am sharing some designs that coordinate with the Ek Success 'Real Estate Sign' large punch. I wanted something that would work for sentiments on cards and tags for Christmas. There are six different designs, in traditional seasonal colors. "Scale To Fit" printing option.